Jan Razauskas. Carbon 23, 2015. Carbon paper and carbon residue on stone paper. 14" x 9.5"
Jan Razauskas. Carbon 25, 2015. Carbon residue on stone paper. 14" x 9.5"
Jan Razauskas. Adjustments, 2015. Acrylic on aluminum. 10" x 12"
Jan Razauskas. Coordinates (detail), 2001. Mirrored plexiglas, steel rods, hardware. 32" x 34" x 84"
Jan Razauskas creates work that explore the possibilities and limits of materials and thought. Jan worked at School 33 Art Center, a city run art space for almost ten years – first as education coordinator, then as exhibitions coordinator. Her paintings, drawings and interdisciplinary work have been exhibited widely and recognized through granting sources including the Maryland State Arts Council, The Contemporary Museum in Baltimore, Vermont Studio Center and Santa Fe Art Institute. Her work has appeared in New American Paintings and been reviewed in numerous publications including Artpapers, CityPaper, Baltimore Sun and Washington Post, and is included in private collections nationwide. She earned a BFA from Maryland Institute College of Art (MICA) and an MFA degree from Transart Institute. Paul Shortt: Can you tell me about your current body of work? Jan Razauskas: My interests revolve around how experience is processed, melded and synthesized, and have led to works involved with time and presence, perception and indicative sign. My work usually involves an emphasis on materials and their indicative properties. Currently, I am making drawings with carbon paper. As sign, carbon paper is black, dense and impermeable; it is also a wafer-thin and delicate 3-dimensional object. I am pushing the paper for possibilities – residue, direct and ghost transfers, collaging cut pieces and the reverse side of the carbon paper into the drawings. The images allude to replication, to patterning as decorative, as surface to a core and as structure, and are investigations into spatial definition. PS: Can you talk about your working method? 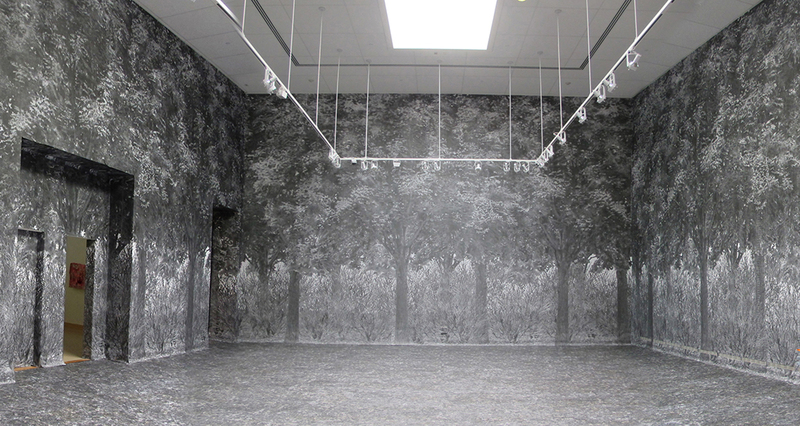 JR: I’m really interested in ideas from previous work that surface again through different media. For example, the carbon drawings look at a recognition of self in another form, but also at an idea from a 2001 work called Coordinates which used thin mirrored strips to fragment the viewer and the surrounding space. In painting, now I’m looking at the invented form – what can that mean, where can the invention come from – and finding some of that invented imagery comes from earlier works, that were 3-dimensional, or perhaps representational. In the painting ‘adjustments’ the bands of rectangles become iterations of a repeating, mutating color. I look constantly at current and past artists, especially those making contemporary abstract painting. I’m also inspired by writings in science, philosophy or literature – recently reading about the discovery of Graphene as the first volumetric 2-dimensional material fueled working with carbon paper. PS: What are you wanting the viewer to come away with when experiencing your artwork? JR: A shock of recognition and a sense of disconnect that comes from the overlap of material actuality and what the materials make or allude to through image or form. And I’d say an aesthetic response to the idea and materials working together and how they are used. 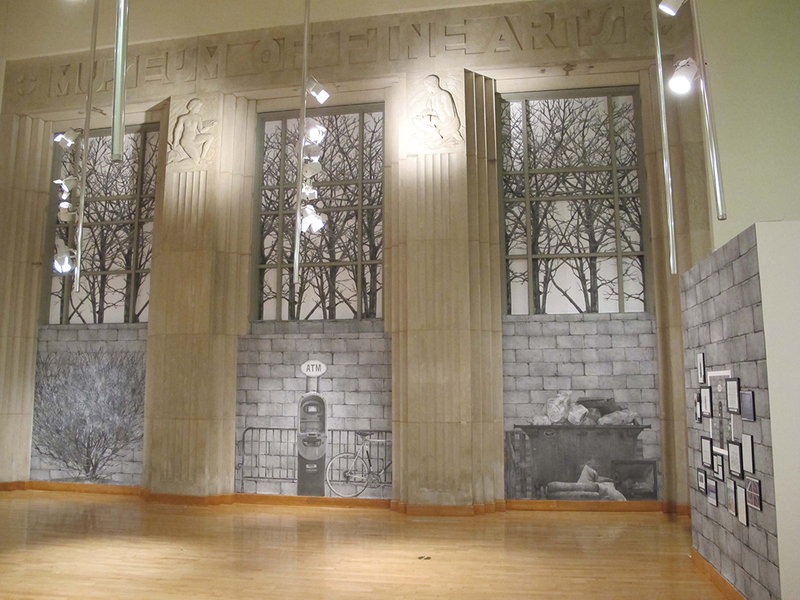 Gary Kachadourian primarily makes graphite and ink drawings of everyday places and objects which he then either scales down or up often creating room sized installations of forests, homes, vacant lots and even chicken bones. Gary worked at the Baltimore Office For Promotion of the Arts (BOPA) for over 20 years. His work has been presented at the Arkansas Art Center, FAM/Western Carolina University, Purchase College, SUNY, PLUG Projects, Kansas City, Lump Gallery, Raleigh, NC, and The Baltimore Museum of Art. Gary Kachadourian. 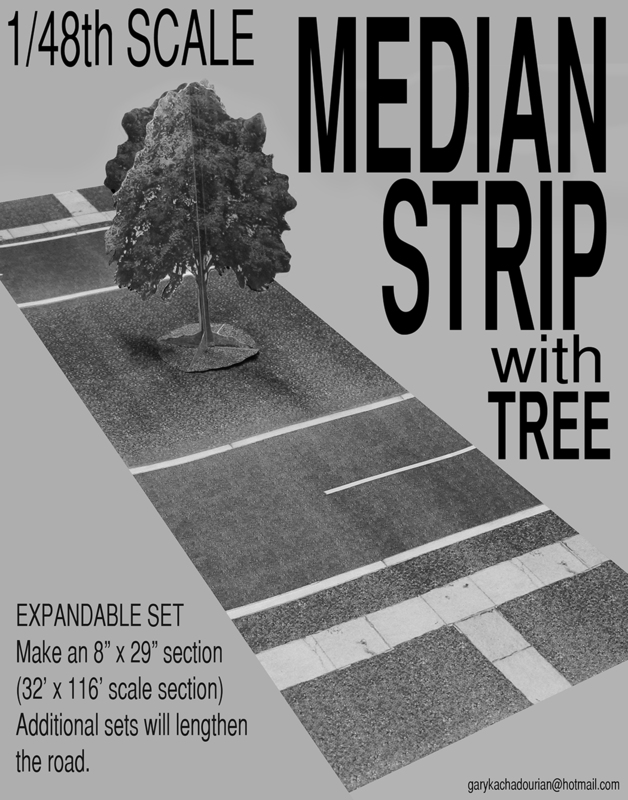 1/48 Scale Median Strip, 2015. Laser printed 5 page book. 11″ x 8.5″ Self published. Paul Shortt: Gary, your artwork is scanned and printed in unlimited editions and often sells for as little as $8. Is this in part to make art accessible to everyone? Gary Kachadourian: Actually the books cost as little as $3 and the posters as little as $5. The inexpensive pricing and unlimited editioning are largely based on how I’ve always liked to experience or own objects, like magazines, books, records, models, and videos or, even better, manufacturer’s catalogs which are usually free. I also like the unlimited edition because it breaks from the collector mentality that I’m somewhat uncomfortable with. I like the idea that things will always be available. I never liked the stress of worrying about if I didn’t buy it now it would be gone forever. There are a number of art world objects I wish would be continuously reprinted. I’d love to have some repro Raymond Pettibon zines and Ed Ruscha books that I could flip through and not worry about messing up. The other thing about low pricing is that it’s based on the object. How much should a xeroxed booklet or poster cost? PS: As an artist whose practice bridges drawing and installation what do you want the viewer to experience or come away with in your work? GK: The drawings are the support structure. I generally don’t show them. I think the installations, books, and posters all offer similar experiences. Sometimes the installations are exactly the same as the scale models in the books, just blown up to life size. In the installation the viewer gets to physically walk in it, in the book the viewer has to project her or his self into the space. As far as the posters go they can be thought of as mini-do-it-yourself installations but I think they function more as insertions into an existing space. In all cases I think one of the big things viewer experience is this sense of seeing/experiencing things they see every day in a different place. PS: You’ve explored color in some of your works, but the strength in them seems to be in reducing reality and everyday objects to gray scale creating a neutral flat world that is also three dimensional. Have long have you been working in this method? GK: I’ve been doing this series since 2007, so about eight years. Black and white was chosen simply because it was economically viable but there are very specific things the gray scale brings to the pieces. Some of these things are controlled and others are just byproducts. So, on one level, one could say that the gray scale may more effectively achieve what you said simply because it is better balanced, I’m a better technician at gray scale. But there is also a soft fuzzy feel to the gray scale and a sense of unreality. The viewer stands in the space and they and other people are the only things in color. PS: Both of you have worked in arts administration roles in the city. As artists who have played key roles in the city for multiple decades what positive changes have you experienced? GK: From years of being an arts administrator and an artist I think that the single greatest achievement is always to just to continue to survive. The Baltimore art scene has continued to do that. The best thing I’ve seen in recent years is that artists have been developing better strategies for getting their work seen outside of Baltimore. This is important in any city except maybe New York and it’s something that needs to continue to be improved. Baltimore has designated arts districts (Station North, Bromo), major art prizes (Sondheim and Baker), and multiple grants to apply for (Rubies, MSAC Individual Artist Awards, The Grit Fund and Creative Baltimore Fund) in addition to multiple graduate art programs that produce consistent new blood into the art scene. PS: What do you think are the major hurdles the city and community as a whole need to overcome in able to continuing sustain the arts in Baltimore? JR: The arts will sustain as long as the colleges keep bringing artists to the area. And with every sweep of new graduates there is a handful with the optimism and wherewithal to start and operate artist-run spaces for awhile. The Baltimore programs seem to encourage artists through a beginning stage, allowing them to move on to grow their careers elsewhere. GK: I think that just the quantity of graduates and undergraduates MICA produces each year will mean that there will always be a pretty solid artist community in Baltimore. The support structure for those artists is a bit shakier. There are a lot more grants these days which is great and there are many more artist-run spaces which is also great. There need to be more commercial galleries and there probably would be if there were more art buyers but I’m not sure that will be changing anytime soon. I feel like commercial galleries and collectors probably provide the best outlet for the no longer young artists and they provide the best link between those artists and the younger artists after they’ve spent time showing in the artist-run and non-profit spaces. PS: What brought you both to Baltimore and how long have you lived here? JR: My parents moved a lot when I was growing up – I went to four different elementary schools, for instance – so I do not have a cohesive connection to any one place. I have lived in Baltimore a long time. GK: I’ve lived here a long time. PS: As an artist couple living in Baltimore what are the benefits and struggles you’ve faced both in your art practices and careers and in raising children in the city? JR: Baltimore is a really harsh town. GK: I think Baltimore is pretty typical of a smaller city in America. It may be a bit weaker than some in that it’s half a dying industrial city and half a city of government workers/civil servants. Neither of these groups are great art supporters so Baltimore may be weaker than most regarding ‘audience.’ On the other hand it may be a little stronger than a lot in producing artists because of MICA. I don’t think there’s any geographical significance to our experiences as an artist couple but being a couple is great in that we may have a better understanding of each others’ compulsions and priorities. PS: What is your current day job? JR: I am making my own work, and I support myself through adjunct teaching at MICA and other area colleges. GK: Adjunct teacher at UMBC [University of Maryland, Baltimore County]. PS: As mid-career artists do you feel there are as many opportunities to show work in Baltimore? JR: No. You have to look outside of Baltimore for that. GK: Right now in Baltimore younger artists probably have more opportunities to show simply because the largest number of galleries are artist-run which are for the most part run by younger artists. I think it’s hard everywhere for “mid-career” artists unless they are “established” as in, have an excellent gallery and great teaching job. PS: You both recently participated in the Los Angeles Printed Matter Art Book. Gary, you’ve participated in many art book fairs and Jan this was your first. What were your experiences like in LA? JR: I am experimenting with the book format at this stage, the artist book realm offers enticing opportunities for smaller and serial work. PS: As an artist couple do you find any overlap among your art practices? JR: I think we have some overlapping interests in drawing, and in ideas positioning the original and the copy. Maybe we will look at that! GK: We talk a lot and look at each other’s work a lot and we often have similar interests. PS: What do you have coming up? JR: Last summer I had a great month-long residency at Vermont Studio Center, devoting time to developing new work, and meeting artists and writers. Having more time in the summer, I am looking forward to developing work in painting and 3D media jumpstarted from the carbon drawings. GK: I’m mostly trying stay home and work on new things. I am doing the Open Space Prints and Multiples Fair and Brooklyn Zine Fest (more sitting behind tables) this Spring. I’m also doing an installation in North Carolina and a small piece for a Graham Coreil-Allen project. PS: What other Baltimore artists or projects should we know about? JR: Interesting, exciting things can be seen in the work of every artist out there. That said, Gerald Ross is making some terrifically singular paintings. And Shaun Flynn treads a great balance between material and meaning. GK: There are a lot of excellent artists and project out there. I don’t want to pick one over another but I will say that I am always waiting for the next visual art piece by Asa Osbourne. He’s better known as a musician in Zomes and Lungfish and only does visual projects sporadically.